Cross Stitch Happy: Another Cute Finish from Wilma! Wilma has been a very busy girl! First she sent photos of the bourse she made using the Octagon Snowflake Fob chart and now she has sent a photo of her latest finish - a Gingerbread bag! 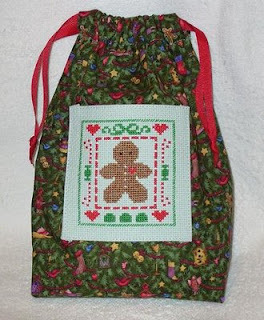 She used an assortment of leftover threads and stitched on 14ct light green aida using the Gingerbread Treasure Bag chart. Great job, Wilma, and thanks for sharing your photo! How adorable & festive! Great work Wilma!! Wilma is so clever!! Great job Wilma!